1time airline's time has come. Last week 1time offered the cheapest flight from Durban to Johannesburg, this week 1time airline is offering the cheapest flight from Cape Town to Johannesburg (at R499, which they point out includes all airport taxes - unlike Kulula and SAA's headline prices). 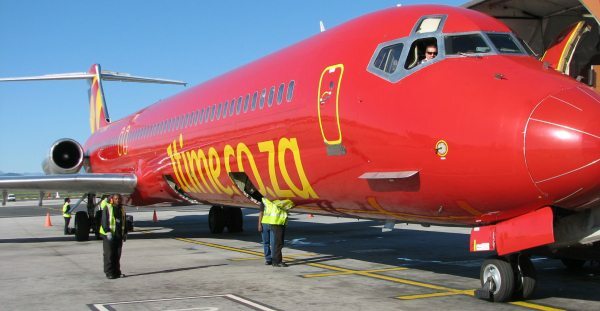 1Time airline flight 1T126, costing R499, leaves Cape Town at 1900 on the 12th October and arrives in Johannesburg at 2100. If you haven't already bought your end-of-year plane ticket from London to Johannesburg keep a hanky at the ready - you'll need it when you see the price of the ticket! You need to very carefully pick your dates of flying from London in order to get a good deal. In this comparison, Air France flights via Paris are the cheapest at £630, and Emirates flights via Dubai the second best deal at £688. WIN a free return flight! Have you got a blog? If so, blog about what you like and don't like about www.southafrica.to and stand a chance to win a return flight between Johannesburg and Cape town OR a return flight between Johannesburg and Durban OR the monetary equivalent. If you don't have a blog, then start one up - it's easy. When kulula.com started excluding airport taxes from their headline fees we were quick to voice our disapointment. 1time airline was not far behind us in expressing their views (of course South African Airways was as quiet as a mouse, as they are also in the rogues' gallery of airlines which exclude airport taxes - which effectively also silenced their subsidiary, Mango airlines, even though they include airport taxes). On the 25th August, we illustrated how 1time airline were pointing out that "unlike some of our competitors, these fares include all taxes". Clearly 1time have been emboldened by the lack of complaints, as they have now stepped up the rhetoric to "unlike kulula, these fares include all taxes". South Africa doesn't have a tradition of competitive advertising. We support 1time airline in this battle, but at the same time wonder whether it'll go to the advertising standards authority. The rules of rugby (they call them "laws") are subject to a fair wad of interpretation. 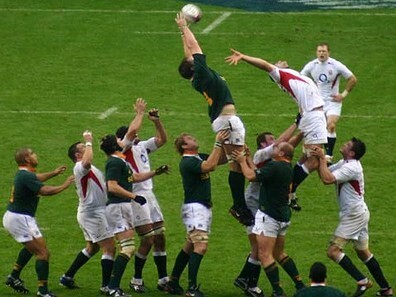 Take for instance the rule that no lifting is allowed at the lineout - I haven't seen many lineouts where lifting hasn't occured, but it's been years since I've seen a referee penalising players for lifting. Given the lack of enforcement and the scope for interpretting the rules in different ways, it's little wonder that many supporters feel that they were robbed when losing a close game. It's also little wonder that boo'ing has become synonomous with watching a game of rugby. Now, Mango airways has entered the boo'ing game. The above screenshot from the Mango airways website explains how to "boo a flight" on Mango. Perhaps this is in response to the outcry over the passenger who got thrown off for shouting out "crapairline.com" on a Mango airways flight (clearly not Mango's recommended way of boo'ing their flights). According to the screenshot, boo'ing of Mango flights is allowed until end December 2007. We ranked the websites of the various airlines operating flights in South Africa (using Alexa rankings). For those interested in statistics, below is a graph which provides an indication of the % of web traffic which South African Airways is reaching through its website. We compared flight prices of airlines flying from London to Paris, and British Airways flights are the cheapest (of course if you've got 12 hours to spare you can take the National Express coach). In our opinion, if you've got the money, Eurostar train is the cleanest and fastest way of travelling from London to Paris. "Is it reasonable that Aer Lingus, which has received vast amounts of state aid, should be allowed to use taxpayers' money to subsidise temporarily reduced fares until Ryanair is driven out of business, and then, as it has done in the past , raise the fares to levels which are profitable for them, but will put air travel to the UK once more out of the reach of the vast majority of Irish people." A Ryanair statement in 1993 from the book by Alan Ruddock, "A Life in Full Flight: The story of the man who made Ryanair take off". Replace the words "Aer Lingus" with "South African Airways" and you have the South African scenario - our airline industry is about 5 years behind Ireland in terms of deregulation.